Brandon Bean was given the task of evolving the world’s most venerable brand while protecting its unique legacy. CBI: When you were named the CEO of Gold’s Gym International, Jim Caldwell, the president of TRT Holdings, Inc., Gold’s Gym’s corporate parent, said, “With the rapid evolution of our brand and changing landscape of the industry, we felt that new leadership was in the best interest of the company.” What was the mandate you were given? BRANDON BEAN: We recognized that we were at a unique time in the evolution of fitness. More people than ever were spending more money than ever on fitness, and we owned the most widely known fitness brand in the world. We needed to position our company to take advantage of this opportunity. That started with building a talented team, defining a strategy, and, then, building a great culture, which is what I was charged with doing. CBI: Gold’s Gym is one of the oldest and most venerable brands in the business, but one that, even now, still evokes memories of Joe Gold, Muscle Beach, Arnold Schwarzenegger, and the movie Pumping Iron. Describe the new version of Gold’s Gym that you set out to create? BB: For over 50 years, people have been coming to Gold’s Gym to get results. That’s where our brand started, and that’s where we still are today. Our mission is to help people achieve their potential through fitness, and that has a different meaning for each person. Fitness is an individual journey, and, even though we’re the largest full-service fitness brand in the world, we still make the same promises to each and every member—that we’ll help them find their starting point, build their path to success, show them the ropes, and be with them every step of the way. And we guarantee their satisfaction. Our latest offerings are about continuing to pioneer the industry. CBI: What was your strategy for implementing that change, while, simultaneously, positioning the company to contend with an intensifying and rapidly changing competitive marketplace? BB: As any industry matures, it’s natural for niches to develop to serve different customer segments. The fitness industry has been maturing, and, in that environment, it was important for us to gain clarity about who our customer is, and how we can best serve them. Low-cost business models have been introduced, which have expanded the market and introduced more people to fitness than ever before, but it’s not a segment of the industry where we feel our brand has anything to add. Our strategy is to leverage our fitness expertise by differentiating our brand based on our proprietary fitness programming. The rise of digital and boutique fitness offerings has shown that today’s consumer is looking for a variety of ways to engage in fitness, and our new GOLD’S AMP, GOLD’S STUDIO, and BOOTCAMP offerings have been introduced to satisfy that consumer desire. CBI: Those offerings seem to be the critical new items in your competitive toolbox. Tell us a bit about the rationale for and the execution of GOLD’S STUDIO. BB: Getting our members engaged in our fitness experience is paramount. We believe that community-based fitness that offers members a variety of ways to work out is a really good way to get results. Whether it’s heart-rate variability training with GOLD’S BURN; high-intensity interval training with GOLD’S FIT; an immersive data-driven cycling experience with GOLD’S CYCLE; or a BOOTCAMP class in the park—our members have access to a variety of high-quality, boutique-style programming, all under one roof at a competitive price. CBI: And, if you would, tell us about GOLD’S 3D. BB: One of our promises we make to every member is to help them find their starting point, and, today, there’s no better way to do that, and to track one’s progress, than with our GOLD’S 3D body-scanning technology. One of the biggest overriding perceptions that the industry needs to correct is the public’s belief that the number on a weight scale is an effective way to judge the progress of a fitness regimen. GOLD’S 3D accurately captures measurements in just 35 seconds, and provides a 3D model of the member, along with comprehensive information that allows them to better analyze physical changes over time. BB: Gold’s Gym is the first brick-and-mortar gym to ever have launched a proprietary digital coaching app. GOLD’S AMP is available to Gold’s Gym members and nonmembers alike, providing everyone with a motivating and results-driven workout experience both inside and outside the four walls of a club. Whether you have six minutes or 60 minutes, there’s something on the app for everyone. Workouts for walking, jogging, running, cycling, the stair climber, the elliptical, and more are at your fingertips, plus push notifications when new workouts are added. Our app provides great coach-led workouts, motivating music, and trackable results. It’s the Gold’s Gym experience—anytime and anywhere. CBI: In what ways has this new direction informed and shaped Gold’s Gym’s marketing and advertising efforts? BB: The theme of our current campaign is “Experience Change.” We’re inviting consumers to Experience Change with Gold’s Gym—to change the perceptions they may have of our brand, and to experience how Gold’s Gym has evolved so they can transform their life. CBI: And, similarly, how has it affected the design and appearance—the look—of your facilities? How much of an investment does it represent? BB: As our systems and programming have modernized, so, too, has the look and feel of our gym—more modern lighting and imagery, and lighter color palettes. Every new gym being built or remodeled has the updated look outlined in our new brand style guide. However, with so many locations around the world, it will take a while for the look and feel of the entire system to change. Each individual location can cost hundreds of thousands of dollars to migrate to the full new Gold’s Gym experience. Given our footprint around the world, as a system, this is in the tens of millions of dollars. 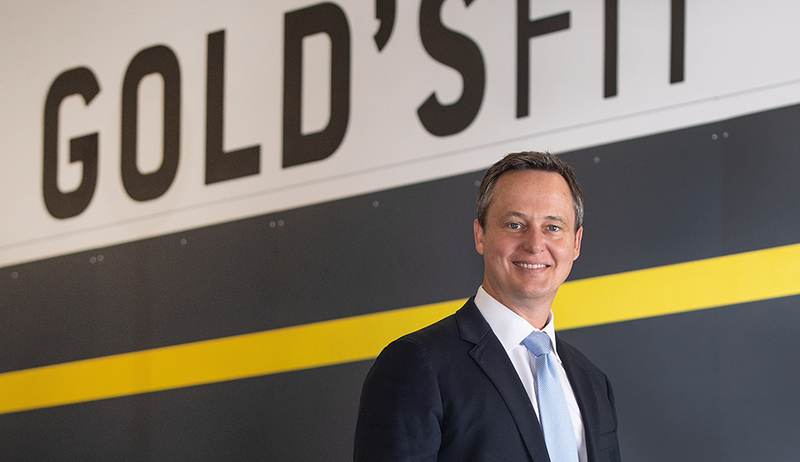 CBI: Though this initiative to transform what Gold’s Gym is—and, importantly, what people think Gold’s Gym is—is still relatively young, what’s your sense of how successful it’s been? BB: The new fitness experience is doing exactly what we designed it to do—expanding consideration; delivering a consistent, powerful experience; and creating strong connections with our members and prospective members. Even though we’re only a few months into our full brand transformation, so far, in 2018, our lead volume in company-owned gyms is up more than 20% over 2017. However, true success for us comes over time as members stay engaged with us and achieve their desired results. CBI: Gold’s Gym has three basic lines of business: its company-owned gyms, a large franchising operation, and a licensing arm. What’s the scope of each? BB: We have more than 700 gyms across the globe, with 150 company gyms and 200 franchise gyms in the U.S. Internationally, we have over 350 locations in 28 countries. India, with over 130 gyms, is our largest international market, followed by Japan, with nearly 70. Saudi Arabia is a great story for 2018, as it will more than double in size, from 10 gyms to 23 by the end of the year. Over the past several years, we’ve grown around 50 units annually, and we expect that pace to continue in the foreseeable future. Collectively, we serve over 3 million members worldwide. Our licensing arm provides branded products around the world, and, given how well-known our brand is, our business is robust and continues to deliver strong annual growth. CBI: Figures that define Gold’s Gym’s financial performance and growth are hard to come by. Can you provide a few metrics? BB: We’re a family-owned business, so we don’t disclose detailed financial results. However, I will say that, with the interest in fitness and in our brand, as well as an extremely accommodating retail environment, the potential for returns for us has never been more attractive. We target unlevered cash-on-cash returns of over 25%, and we continue to build new gyms. As appealing as the gym business is, our real source of growth over the next few years will likely be our franchising, licensing, and digital businesses. CBI: Growth is obviously high on the Gold’s Gym list of objectives. How many clubs did it open last year, and how many does it intend to open in 2018? What countries, or areas of the world, does it regard as prime growth opportunities? BB: We opened 49 new gyms around the world in 2017, and the network is on track to exceed that in 2018. Last year, we further expanded our international footprint with 15 new gyms in India, and seven new gyms in Japan. An international agreement was signed in Iraq, and plans to expand in Vietnam and Thailand are well underway. Meanwhile, Saudi Arabia is set to double its market share, to 21 gyms in 2018, and we also intend to expand in Europe, Qatar, and China. On the domestic side, we plan to add 25 clubs in 2018, and our target markets include Atlanta, Minneapolis, Orlando, Tampa, the New York metro area, and San Jose, CA. CBI: Long-term—let’s say, five years from now, 2023—what will the Gold’s Gym footprint look like, in terms of number of facilities, countries, and members? BB: Our focus is on being the best, and, if we accomplish that, then staying the biggest will follow. Our current strategic plan is for us to have over 1,000 gyms around the world, serving more than 5 million members in over 40 countries. CBI: We understand that you’ve recently opened some very impressive gyms in Alexandria, Egypt, and Amman, Jordan. BB: These gyms, which opened last year, set a new record as two of the largest Gold’s Gym facilities ever built. They each exceed 150,000 square feet in size, and showcase incredible features, with the finest finishes throughout, the goal being to deliver the very best to a growing customer base in those markets. CBI: You’ve mentioned that while the Gold’s Gym brand is quite consistent from country to country, the offerings may differ from place to place based on local traditions and preferences. BB: Our brand is aspirational in most of these countries around the world, and we’ve positioned ourselves on the elite end of the fitness experience. While fitness techniques are fairly similar worldwide, cultural influences do play a role. For example, in Saudi Arabia, there are separate ladies-only gyms. In India, we’re closely aligned with the film stars of Bollywood, which informs our media and programming efforts. Our international franchisees do a fantastic job of providing the right programs for their particular culture. CBI: Innovation and the adoption and utilization of new technologies obviously are also prominent among Gold’s Gym’s current priorities. What more do you see the company doing with technology? BB: Our core competency as a brand is fitness, and we’re intently focused on serving members around the world who have a passion for our brand. GOLD’S AMP is the beginning of our digital fitness platform, and will continue to evolve to serve people around the country, and around the world, who want to access the Gold’s Gym fitness experience. CBI: What’s next for Gold’s Gym? BB: We’ll continue to innovate both inside and outside of the four walls of our gyms. There are a number of items that our innovation team is working on, but the one that we’re close to launching brand-wide is GOLD’S CARE. Our country’s healthcare system faces tremendous challenges, and Gold’s Gym sits in a unique position to make a difference. GOLD’S CARE is essentially a preventative-care practice located inside of each Gold’s Gym. It’s managed by one of our registered dietitians and combines our fitness programming and nutritional expertise to provide our members with a 90-day program to help them reduce the risk factors we’ve identified for them. 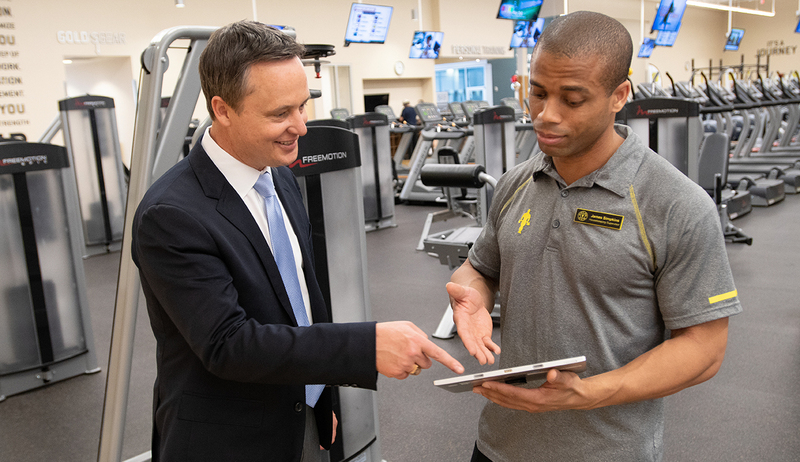 Corporate partners, insurance companies, and the medical community recognize that fitness is often the right prescription, and, now, Gold’s Gym is working with them to make it available to consumers. Colin Grant, the CEO of the Pure Group, which has 35 yoga and fitness facilities in South Asia, has never considered failure an option. Jason Reinhardt, founder of Go M.A.D. Fitness and IHRSA board member, shares his ideas on success and talks about his passion for fitness.